This spacious 10×6 Windsor storage shed comes with a very traditional design. The apex roof gives the interior a tall, roomy feel; increasing its storage potential and also making it really easy to move around in. Not to mention the fact that it also provides incredible protection against the elements. The shed does have a very rustic, natural look which won’t be to everyone’s preferences. The good news is you can alter this quickly and easily with a coloured treatment. Whilst it may not make the wood any smoother, it will give it a much more professional finish. 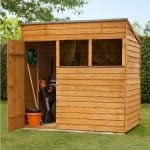 One of the main factors the manufacturer has focused on in the build of this shed is privacy. As you can see, it comes with no windows. This really gives the shed a more solid, secure look. The only downside to this is that there isn’t really any security included. Turn buttons protect the doors from opening in harsh weather, but they won’t keep potential burglars out. So a hasp and staple and padlock will be required. Shed Store have dip treated the timber before shipping it out, though you will still need to continue to treat it annually. One benefit of this is the 10 year anti-rot warranty provided. The overlap cladding provides a more rustic, rough design which won’t be to everyone’s tastes. A coloured treatment will help you to add a more attractive finish if preferred. Part of the budget Windsor collection, this windowless apex overlap shed is huge. In comparison to many competitor sheds of the same size, the doors have an exemplary wide design. This makes it a good choice for storing large plastic outdoor furniture, bulky tools and equipment and even a workbench or two. However, as its low cost highlights, the building isn’t really designed to be used for anything other than simple storage. If you’re looking for a building you can use to work in, we’d recommend choosing one with a tongue and groove floor. This is one of the taller sheds on the market, all thanks to the apex roof design. When you’re searching for a shed you’ll find the apex roof models tend to be the most popular. This is because they add not only an incredible amount of interior height, but also a fantastic level of water resistance. The only downfall is that the roof is covered by a pretty flimsy felt. So if you want to guarantee the roof will last, it is recommended that you upgrade the felt. The solid sheet floor has both good points and bad points. The good news is it is responsible for keeping the purchase cost low. The bad news however is that it doesn’t feel very sturdy. If you only have light equipment, it will be capable of easily holding the weight of your storage. However, you still may find it a little unsettling to walk across. For this reason many customers choose to strengthen the floor with another solid sheet of wood. The good thing about doing this yourself is that you can choose the thickness. It isn’t overly difficult to do provided you have some DIY skills. It’s easy to spot an overlap clad building thanks to its rough-sawn design. It’s quite a weak, thin material and it presents a more rustic design. Unlike Shiplap, the panels overlap on top of one another, creating a more textured style. If you’re not a fan of this rough look, it is possible to use a coloured treatment to add a more aesthetically pleasing finish. To create this particular overlap shed, only selected timber has been used. It also uses the traditional square overlap cladding, rather than the weaker featheredge variety. It’s not unusual to see a standard 28mmx28mm frame within its interior. This is the most common type of frame and it provides a more than adequate stability for overlap buildings. With overlap the treatment requirements tend to be a little stricter than they are with Shiplap clad sheds. However, as this one has been dip treated it does offer a more weather-resistant barrier than basic models. It will still need to be treated shortly after the shed has been assembled and then on a yearly basis after that. However, the dip treatment makes it more resistant to warping. 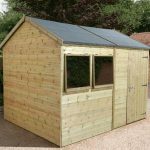 With the right maintenance, the shed offers a 10 year anti-rot guarantee so in essence you are getting an exceptional value storage solution. Though the cladding may not be particularly secure, the manufacturer has made sure its security is boosted with a windowless design. This is a great feature on this size building as it ensures nobody can peer through and see what you are keeping in the shed. It also makes it an excellent building to use as a workshop. Though remember, you will need to upgrade the floor if you want to use it as a work area. Tall double doors are situated at the front of the building and they benefit from a really wide opening. We would have liked to have at least seen a pad bolt fitted so you can padlock the doors shut. However, this model only comes with turn button catches. However, as it has a ledge design you can easily install a hasp and staple and then add a padlock to that. This is one of the most private sheds available in the Windsor collection, though its security leaves a lot to be desired. It isn’t hard to add good quality security to the building however. Of course, if you don’t plan on keeping anything valuable in storage the lack of security isn’t going to be a problem. However, we do suggest adding a good level of security just for peace of mind. You aren’t going to be blown away by the extra options available. With just two to choose from, there aren’t a lot of chances to really customise the building. The only extra on offer that will make a difference to the shed is the treatments. As mentioned earlier in the review, a treatment is supplied with the shed already free of charge. However, the extra ones are offered in numerous colour options. Cedar Red will give the shed a chic, rustic style, whilst the Ivy Green will make it really stand out. These are just two colour options available. They also come with the benefit of being 100% safe to use around pets and plants. The other option may be useful, but it isn’t classed as essential. The DIY Assembly Assistance Tool Kit is packed with a large collection of different high quality tools. A saw, safety gloves, hammer, spirit level, brushes and a hammer are just some of the tools you’ll find in the kit. 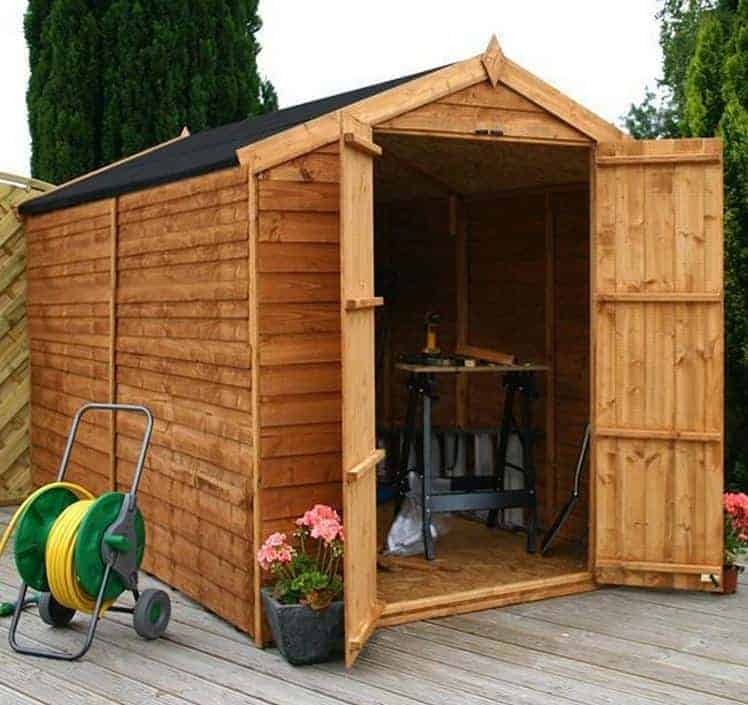 They aren’t just designed for this shed; they can be used to assemble other outdoor buildings, or you can add them to your DIY collection. 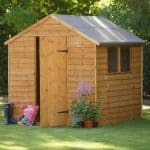 Being an overlap building, this shed is focused more upon offering good value for money rather than exceptional quality. Saying that, it does still offer a reliable and durable design providing you treat it as recommended. Overlap isn’t known for being particularly durable, but this shed has been dip treated. Once you top up this treatment and continue with annual treatments thereafter, it offers an exceptional longevity in comparison to other overlap sheds. Being one of the larger sheds in the Windsor range, you do benefit from a lot of interior storage space. However, it doesn’t give you the option to add internal shelving so this may let it down a little for you. It is the size of the shed that makes it slightly more challenging to build. The fact it doesn’t come with windows is an advantage as you don’t have to worry about fitting the glass/styrene. However, it will still take a while to build. 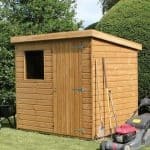 This large shed does offer superb value when you take into account the free dip treatment, storage space and incredibly low cost. Even if you want to improve the floor’s strength, it isn’t going to cost a lot to do this. Final Thoughts: This brilliant overlap shed is one of the largest you can buy and it has room for practically anything you need to store. Though the cladding isn’t as water resistant as Shiplap, thanks to the Dip treatment provided by Shed Store, it does have slightly more protection than the majority of overlap sheds on the market. 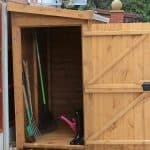 We would advise adding a good amount of security to the shed and if you need to store anything heavy, removing the floor and using a concrete base would be an excellent option. 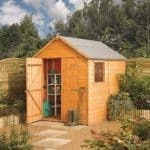 As long as regular treatments are maintained, the shed comes with a 10 year warranty against rot.